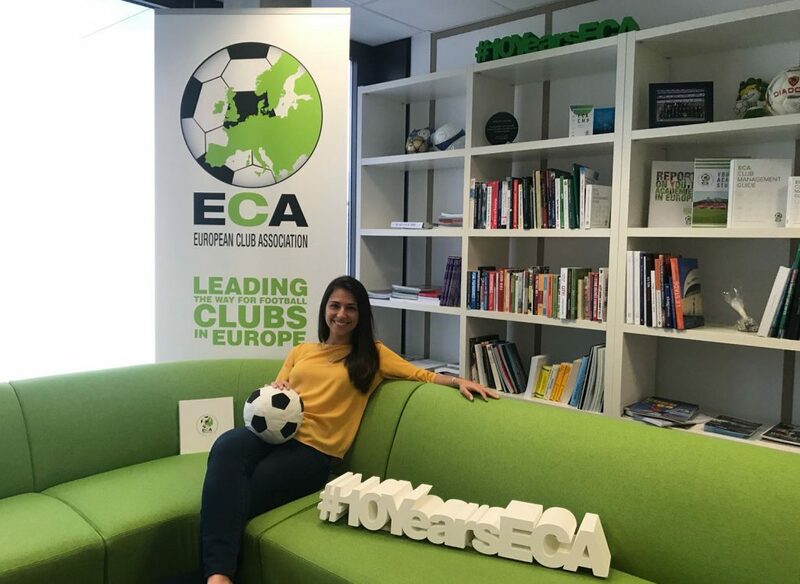 I am Raquel and I am interning at the European Club Association. I was born and raised in Brazil and I had the great opportunity to study at an American university in Tampa. There, I majored in Sport Management and was able to work for the United Soccer League for a year. Since I was a little girl, I knew that my future would be in the midst of the sports world, more precisely, in the football world. I had a great experience in the US but joining the FBA got me closer to being able to live my dream. ECA is an independent body that represents many clubs at European level. It exists so it can protect and promote European club football. Its aim is to create a new, more democratic governance model that truly reflects the key role of the clubs. 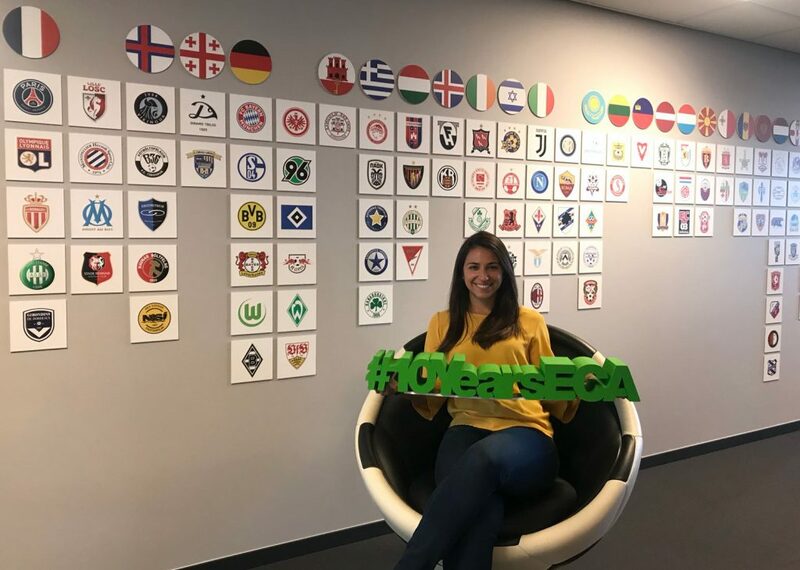 I started interning for the European Club Association in the beginning of March and I have had great experiences since then. I have been able to work in different areas such as women’s football to organizing logistics for events. I have also been able to meet incredible and powerful people in the world of football along with some former formidable players. ECA has an office in Nyon with about ten people who are dedicated to their jobs and who all share the same passion for football. The fact that there aren’t as many employees as other important football organizations, gives me the opportunity to interact with everyone in the office and work with various topics relating to football. I have been with ECA for almost three months now and I can definitely say that I have learned a lot and that all the experiences and opportunities that I’ve been given so far, has helped me grow as a professional. In 2016 I started interning for the United Soccer League, second division football in the USA. After my internship period was over, I got hired and I was able to find a passion, which was marketing and video editing. As I mentioned before, I worked at USL for a year and then I decided I wanted to expand my knowledge in football business. At first, it was very scary to have to leave the US and start over somewhere else again, but I knew I still had a lot to learn. I then found The FBA and decided to apply. Once I sent everything in and was accepted, I found out I was the only girl in the group. It was intimidating and encouraging at the same time, I was proud to be the only one there, but it was also alarming that out of ten students, I was the only female. Some of the classes we had during our first and second modules, I had already taken them in college, but the different thing was, they were all about football in specific. Sure, I knew the basics, but I realized there is so much more to learn when you study one specific sport. Those sessions opened my eyes to many different areas in football and definitely put me in contact with some amazing people in the football world. So far, being able to learn from those people was one of the most special things about this course, along with all the networking and of course, the family we became. Having lived in Brazil, the United States, and now in Switzerland, I was able to be in contact with three different types of football. The sport itself can be the same, but on the business side, there can be completely different objectives to each side. Even with the difference, I was able to work with marketing, video editing, some event planning, women’s football and various other areas during my experience in those three countries. At ECA, I engage a lot with some club representatives, I assist with the Club Management Programme with Oliver Jarosz and Siri Wallenius, I do some research to help ECA to always be on top of every information needed, and also, I am working on a Women’s Football Report which has challenged me to learn more about the topic and to understand its differences from men’s football. Being able to work with women’s football has been one of the highlights for me in this internship. I never imagined myself being so close to the women’s sport and in just a couple of months, I have been in contact with some amazing and inspiring women who are fighting for a change and I caught myself being one of those women, someone who’s trying to contribute to the growth of women’s football as well. Joining The FBA was for sure a great choice, both personally and professionally. I now am able to live my dream, work with what I love, and meet great people along the way. I still have a little over a month at ECA and I am sure it’ll come with more knowledge and experience. I believe that these were the first big steps I took, and there will be a lot more to come. Raquel Madruga is a Candidate of The FBA’s Professional Master in Football Business, expected to graduate in August 2018. She can be contacted via LinkedIn. The European Club Association is the sole, independent body directly representing football clubs at European level. For more information visit their website.